Source Image from Distant Worlds websiteHave you ever wished you could hear some of those great Final Fantasy pieces played by an orchestra instead of the game's limited midi sounds? Look no further than the Distant Worlds tour playing the music of Final Fantasy. It would appear that the tour schedule is close to wrapping up and if you were one of the American fans that got to see the concert live and in person while the tour was in the States, you're lucky. If you are like me though and were unable to enjoy the music live, it doesn't mean that we have to miss out on the glorious orchestra sound. The official website of Distant Worlds: Music from Final Fantasy allows you to purchase the two CDs of officially released music from the concerts. It also allows you to purchase the tracks as direct MP3s or if you just want a gander at the sounds, there is a streaming option directly on the website here. It is very exciting for me to listen to pieces from Final Fantasy VI such as Dancing Mad (Kefka's Final Fight Music) or the Opera House "Maria and Draco" sequence in full orchestra and choir glory. 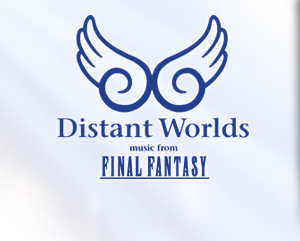 If you're a fan of the series or just want to listen to some beautiful music you may have passed on before because of the games, then give Distant Worlds a spin.